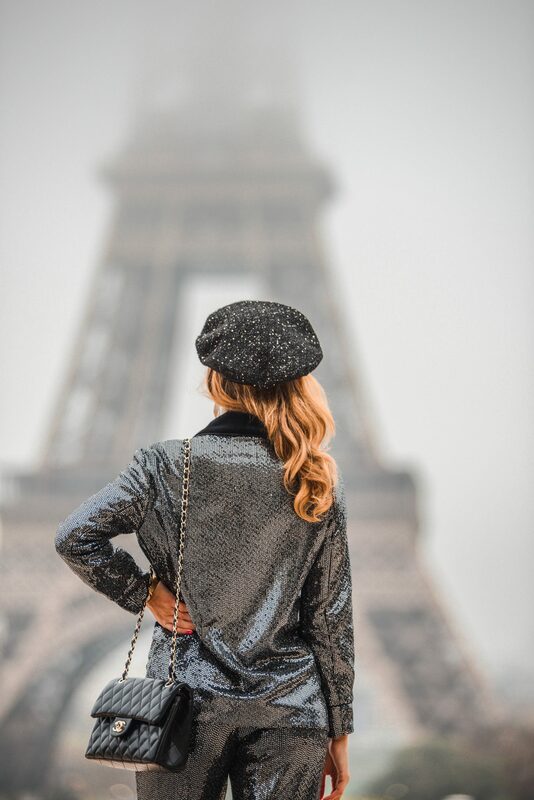 Ever since I was a little girl, I have always dreamed of going to Paris! I was absolutely obsessed with the Eiffel Tower and really wanted to visit this city. The first time I visited Paris was a couple of years ago and it was a love of first sight! There are so many amazing places in this city that it is hard not to fall in love! I am sure you have seen on my stories that I was in Paris last week! So during this visit, I was determined to have a photo shoot at the Trocadero (the place where you get the best view over the Eiffel Towe! Paris always makes me feel extra chic, so I decided to do a shoot with some very chic and festive suit! As Christmas is fast approaching, I have already started my festive shopping and this suit was one of the first items I got. Once I saw it I realised that it will be perfect for my upcoming shoot in Paris! My schedule in Paris was quite busy and I did not have that much free time, so I decided to schedule this shoot for the first day. I pretty much left my suitcases at the hotel and went straight for the shoot! As always, I got pretty ´lucky´ and on the day of my arrival, Paris was hidden under a terrible fog! According to the locals, that only happens two or three times per year. So you can get the idea of how ´lucky´ I was! The fog, however, did not stop us from doing the shoot and I was very happy with the final results! In the end, I was almost glad that it was foggy, as the pictures turned even more original than the usual Trocadero pictures which you see across the internet! Indeed, my pictures are quite different..you can only see half of the Eiffel Tower! I collaborated with Vio (@photographer.in.paris) for this shoot, and thanks to his professionalism, we were still able to create great pictures, despite the fog! In general, do not ever let the circumstances get on your way to your goal! Not everything is in our hands, but to be able to succeed, I strongly believe that you have to be able to make the best out of a situation! This is exactly what I and Vio did! I hope you enjoy the pictures! I was wearing a Chanel Bag and a total Zara look! Everything except the shoes is from the most recent Zara collection. These pictures are absolutely amazing and I love what you are wearing! Wow, increԁible blog layout! How long have you been Ƅlogging for?